Tired of the rat race? Feeling like life has you caged in? If so, stay away—far away—from La Villa Hamster. 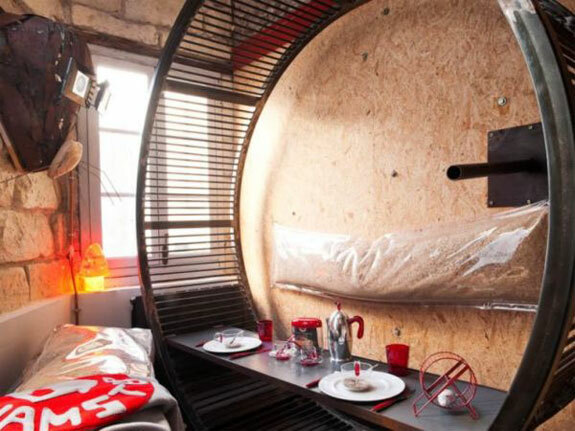 At this unusual hotel in the city of Nantes in western France guests overnight in a sort of oversized rodent cage. 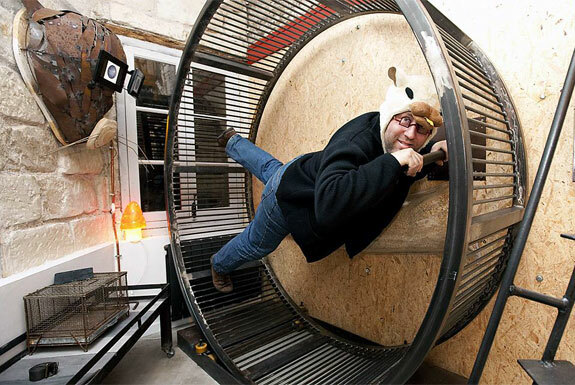 • a working human-sized hamster wheel! 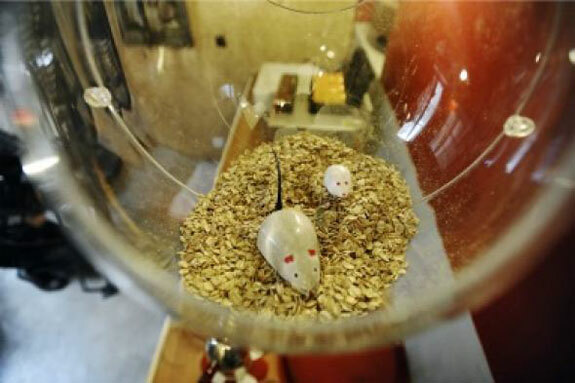 For those looking to take their rodent experience to another level—or for couples who have a particular predilection that we really, really don’t want to know about—Villa guests have use of his and her hamster masks during their stay. Wear them and you may be overcome with the urge to pace back and forth along the wall, or to jump in fright whenever some one taps on the window. 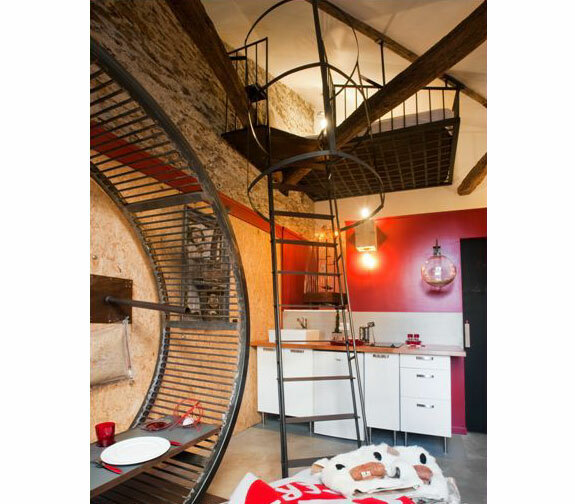 To complete that feeling of being a lab animal, a stay at La Villa Hamster is perfectly paired with some time finding your way through the giant human maze at Château & Jardins de Villandry. 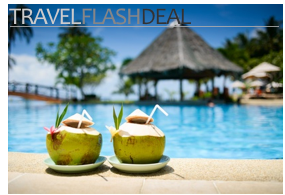 But Spot Cool Stuff has a gnawing feeling that the experience of La Villa Hamster would get stale after more than night, especially when you are paying €150 for the privilege. 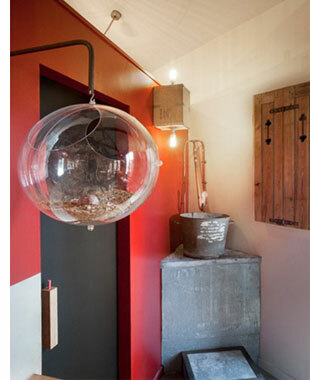 Those looking for an even more primitive overnight experience take note: the proprietors of La Villa Hamster has another hotel in the works—an underground apartment that mimics the experience of being a fetus in a womb. When we learned that this property will not be accepting guests for at least another year we could utter only one in response: Rats! Hahah that would be great.I wouldn’t pay 150€ for that though. haha thats a funny name 4 a hotel lol!!!!!!!!!!!!!!!!!!!!!!!!!!!!!!!!!!!!!!!!!!!!!!!!!!!!!!!!! Haha, The Hotel New Hamster lol. Quite original but doesn’t look very attractive though. Anyway – a funny and entertaining post. im going to bring her food and water. we will be staying in a hotel which allows pets .lol! and im going to bring her bedding the only thing im worried about is the long ride! Wheely unusual 🙂 Is the hat included?